Gentile, Horoho & Avalli, P.C. Named to List of Ten Best Law Firms for Pennsylvania for Client Satisfaction - Gentile, Horoho & Avalli P.C. Gentile, Horoho & Avalli, P.C. has been selected for membership as one of the ten best law firms for Pennsylvania by the American Institute of Family Law Attorneys “AIOFLA”. The AIOFLA is an impartial third party attorney and firm rating service and an invitation only legal organization recognizing excellence of practitioners in the field. Gentile, Horoho & Avalli, P.C. 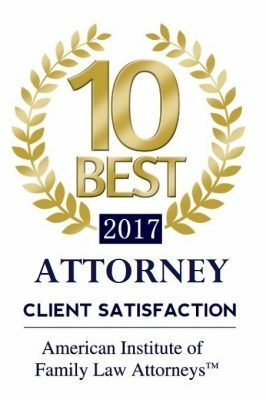 has made the exclusive list of ten best law firms for Pennsylvania for client satisfaction in the practice area of family law. The firm was selected after having been formally nominated by the Institute, clients and/or a fellow attorney. The firm has attained the highest degree of professional achievement in family law and has an impeccable client satisfaction rating. AIOFLA was created with an innovative idea that their organization could save time, energy and effort for those who are looking for the most qualified attorney/firm in the area and at no cost to the consumer. The ratings systems help client throughout the United States make educated decisions when it comes to choosing their representation in family law. AIOFLA membership is exclusive and extended only to those select few who have reached the top of their profession while doing so with the client’s satisfaction being of the most paramount importance. This entry was posted in General News, In The News, Press Releases and tagged Award. Bookmark the permalink.